How do I request veterans' funeral benefits through Bryan Funeral Service? In order to be eligible to receive funeral benefits or compensation for expenses associated with final arrangements, you must be a veteran discharged or separated from active duty under conditions other than dishonorable, and have completed the required period of service. U.S. Armed Forces members who die on active duty are also eligible, as are spouses and dependent children of eligible living and deceased veterans, and of current and deceased armed forces members. For detailed information on determining veteran status as it pertains to funeral benefits, visit http://www.cem.va.gov/cem/burial_benefits/eligible.asp or contact the U.S. Department of Veterans Affairs at (800) 827-1000. VA burial benefits include a grave site in any of the country's 131 national cemeteries which have available space. When a veteran or a qualifying family member is buried or inurned in a national cemetery, at Arlington, or in a National Park cemetery, the government will pay for the opening and closing of the grave, perpetual care of the grave, a government headstone or marker, a burial flag, and a Presidential Memorial Certificate, at no cost to the family. If the veteran's death is service connected, VA will pay a burial allowance up to $2,000. 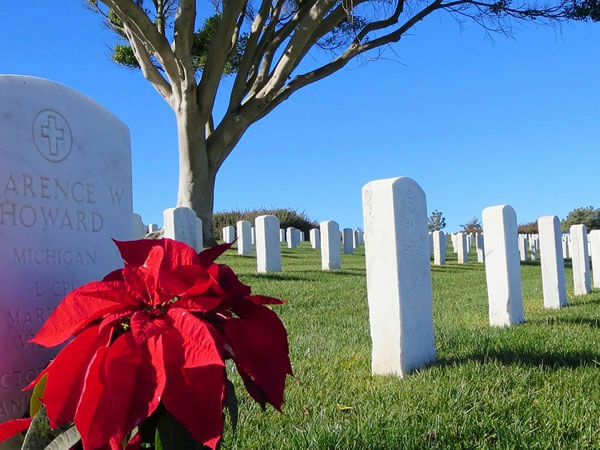 VA will also pay the cost of transporting the remains of a service-disabled veteran to the national cemetery that has available grave sites nearest the home of a deceased veteran. The person who bore the veteran's burial expenses in such cases may claim reimbursement from VA.
For veterans who, at time of death, were entitled to receive pension or compensation, or would have been entitled to compensation but for receipt of military retirement pay, VA will pay a $300 burial and funeral expense allowance. When death occurs in a VA facility or a nursing home with which VA contracted, eligibility is also established. Additional costs of transportation of the remains may be reimbursed. When filing reimbursement claims of service-connected deaths, there is no time limit. In any other deaths, claims must be filed within two years after permanent burial or cremation. The VA $300 plot allowance is not payable solely on wartime service. VA will pay the allowance when the veteran is not buried in a cemetery that is under U.S. Government jurisdiction if the veteran is discharged from active duty because of disability incurred or aggravated in line of duty, if the veteran was in receipt of compensation or pension or would have been in receipt of compensation but for receipt of military retired pay, or if the veteran died while hospitalized by VA. The $300 plot allowance may be paid to the state if the veteran is buried without charge for the cost of a plot or interment in a state-owned cemetery reserved solely for veteran burials. Burial expenses paid by the deceased's employer or a state agency will not be reimbursed. How do you apply for these benefits?